Home→Mods, Tech Talk & Tips→Projects & Mods→Can you see me now? One day several weeks ago Rob and I were out in our driveway talking about something when I happened to look over at our motor home. What the heck? 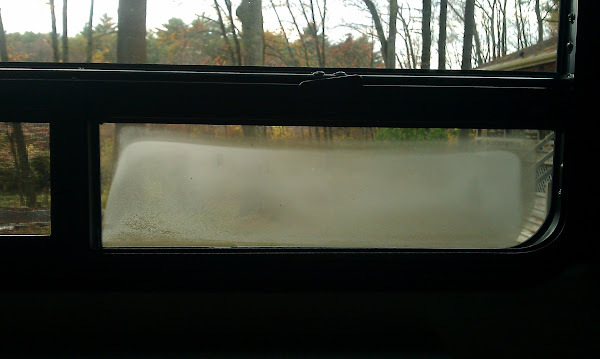 The vent window on the passenger side of the bedroom window had condensation between the thermal panes and had started to fog. Actually there was almost a quarter inch of water pooling at the bottom inside the two panes. Now when we first bought our 2006 Fleetwood Discovery in October of 2010, we were not blogging then so unless we relayed our fogged window saga in person most of you won’t understand why this recent development caused us immediate frustration. 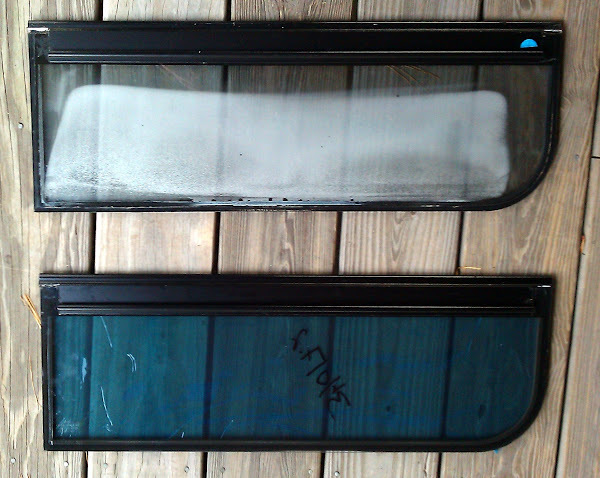 Even though we thoroughly inspected the unit before purchasing it and even had experienced RV’ers take a look at it, each time we visited the unit it was very overcast so none of us noticed that all (yes, ALL 11) of the windows were fogged. And fogging of the worst kind – not visible moisture, the dreaded “white film”. Realize too that being newbies we had absolutely no experience in the world of RV’s so we weren’t aware that fogged windows were a pervasive and nearly ubiquitous problem. 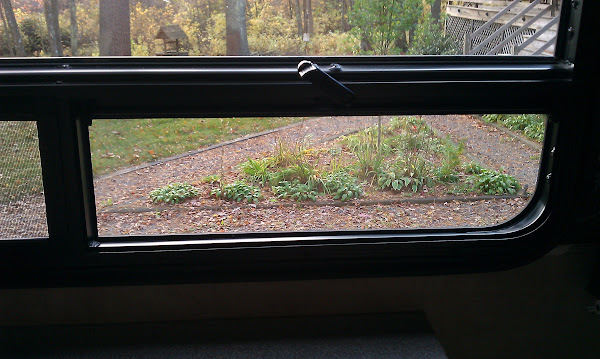 Our particular windows were manufactured by Se-Gi, one of the primary RV window manufacturers and they seem to have had more issues from what we can tell. We also weren’t aware at the time that our dealer would consider this a “cosmetic” issue, so it would not be covered under our warranty. To this day we feel our dealer (Flagg RV in Smithfield, RI) took advantage of our naivety regarding this issue and we will not patronize them in the future. Now there’s a big long story associated with this but I won’t bore everyone with the gory details. We came to an agreement with the dealer who agreed to partially fund the repair. But, they wanted to remove all of the windows and send them to FL to be repaired – that would be a 6 – 8 week process IF the white film could be removed (if not the delay would be indeterminate). Since by now it was end of November and we were leaving in January, this was not an option for us. Not to mention our new coach would be sitting outside in the middle of winter with no windows! NOT! Another option would be to drive to FL and have them repaired there but since this was our first trip and we had the 3 cats on board, we ruled out this option as well. We took it upon ourselves to contact Fleetwood directly and get pricing for all new windows. New windows would reduce down time to a day or maybe two. Manufacturing time was less than two weeks. And best of all it was the lowest cost option! So after a lot of haggling the light dawned on bonehead dealer (that it was cheaper and easier for them too) and they finally agreed to order the windows from Fleetwood (who in turn would order them from Se-Gi) and they would cover the cost of the purchase and installation of three of the windows. They only agreed to these three because we pushed the fact that the driver could not see out of these windows which would be a safety issue, not a cosmetic issue. So the ten new windows (the coach has 11, but the bathroom window is frosted by design so the fogging is not visible) were ordered with an anticipated delivery date of mid-December. Due to the Christmas holidays and plant shutdowns, the windows didn’t arrive until shortly after the new year and we were planning on leaving to head south on the 15th of January. Luckily (or in Rob’s opinion, unluckily) the techs at the dealership mistakenly installed seven of the windows so we just had to pick up the three additional ones. I say unluckily because Rob wasn’t happy with the way they installed the windows and would have preferred to install them himself. 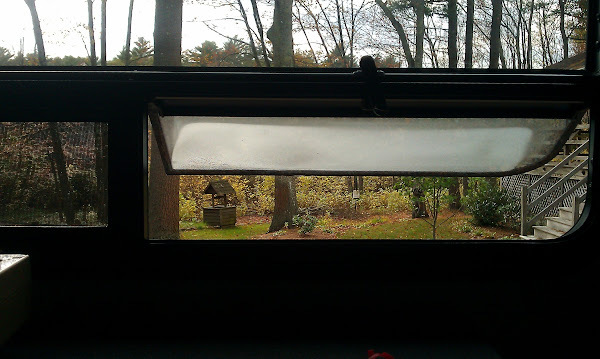 At the window to wall flange they used sticky gooey butyl tape instead of the Clean Seal® weatherstripping (rubbery non sticky high grade seal) used by the Fleetwood factory. Later, Rob actually removed a couple of the windows that were oozing butyl and replaced the seal with the proper material. After we returned from our trip in 2011, Rob took out the three remaining fogged windows and installed the new replacement ones. And so we lived happily ever after with our perfect windows – at least that’s what we thought! The new windows came with a one year warranty but when we placed our original order for the new windows, Sindi, our customer service rep at Fleetwood assured us that Se-Gi had “fixed the problem” so we shouldn’t have fogging problems in the future. Yeah, right! Now you can probably understand our frustration when after only 20 months we experienced the same problem, even if it was just this one small vent window – is this a sign of more failures to come? GRRRR! At first we thought that maybe the whole window had to be replaced (to the tune of $485 – this is the most expensive window on the coach) but then we realized the vent window can be removed without disassembling the entire window. Whew, that was good news! We quickly contacted the same customer service rep, Sindi, who we had worked with the first time via email. Her reply was that “this is not a common occurrence with replacement windows”. Although after Googling RV fogged windows over the past few years, I’m not sure that I believe that! She in turn sent our email to Se-Gi who requested that we send pictures of the vent window which we did. Within a few days, Sindi responded that Se-Gi was shipping us a new vent window and to show their good will, it was free of charge. Well, I have to admit that that helped to take the sting away. And kudos to Sindi and Fleetwood for following thru with this and getting us a free replacement. Last week the window arrived from Se-Gi with instructions on how to remove the old window and install the new one. So in the midst of all our home improvement and boat tasks, here was another “to do” to be added to our never ending list. Over the weekend, Rob decided to install it thinking it would be a quick and easy job. Wrong! When he went to fit the new window into the existing frame, the metal extrusion at the top of the window was over an 1/8 of an inch too long. Oh, no it didn’t fit! 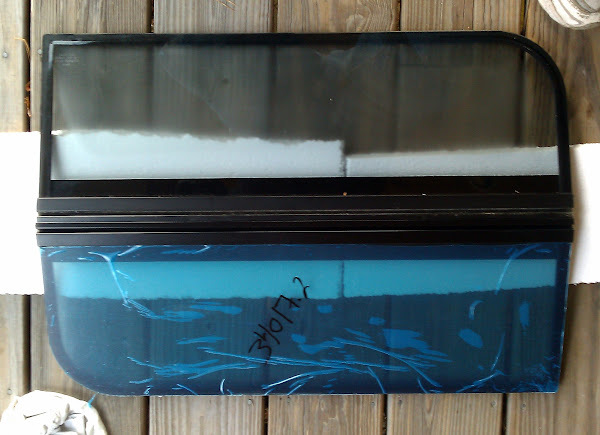 So time for another decision – send it back or try to file it down without wrecking the window. Too much of a hassle to send it back so he opted to slice off the excess (very carefully) with his sliding miter saw. Success! Of course after trimming it, he had to apply some black paint to the ends. So the quick and easy 10 minute job turned into a two hour endeavor! Hmmm, maybe it’s time to upgrade to a newer motor home…..